The cast-on is how you get your stitches onto the needles to start a new project. There are many ways to cast on, all of them have different qualities such as stretchiness and appearance. The most common way to cast on is called the Long-Tail cast-on. It gets this name because you must have a tail of yarn long enough to be a part of the stitches that are cast onto the needles. The long tail cast on is considered the basic cast on. Lots of beginners seem to know the backwards loop cast on, but the long tail cast on creates a more even and sturdy cast on. It isn't appropriate for cast on in the middle of a row, however, because you have to measure off a long enough tail to produce it. See the related videos for some tricks of how to measure the tail properly. To perform the long tail cast on, you have to start with a slip knot. Then you must learn how to hold your hands with the yarn wrapped. Once you get this hand position and the motions of this cast on, it becomes the quickest way to cast on a sturdy edge. Holding the slip knot on the right hand needle, with the point of the needle pointing left and the tail of the yarn towards you, hold your left pointer finger and thumb together. Your hand will be like 'OK'. Slip your pointer finger and thumb in between the two dangling strands. Then, close your other fingers around both strands of yarn. Now spread/separate your pointer finger and thumb and rotate your palm to face the ceiling, continuing to hold onto the strands of yarn. Holding the slip knot on the right hand needle with your right hand, begin the long tail motion by going under the strand closest to your face (in front of your thumb), over the back strand and back thru the loop wrapped around your thumb. Holding all the strands but then dropping the loop off your thumb, you can swoosh your thumb around, hooking the yarn again and securing the new loop on the right hand needle. After you've cast on your stitches, jump right into the knit stitch. Before you can cast on any stitches you'll need to start with a slip knot on the needles. Watch this video to see how! It's important to have a long enough tail before using the long tail cast on. 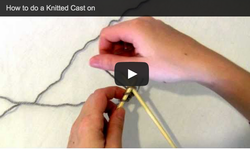 See this video and learn how to quickly measure your yarn before attempting the long tail cast on. Using two tails to cast on the long tail cast on means you never have to measure your yarn! The backwards loop cast on is often the first one beginners learn. It is fast and easy to do in the middle of a row. It has a less sturdy spine than other cast on methods, however. The knitted cast on has a sturdy spine and is easy to learn if you know the knit stitch. It is slower than the long tail cast on, however.